Researchers on the International Space Station has performed tests with SPHERES experimental satellites in conditions of zero gravity, the cosmonauts’ blog at Roscosmos webpage says. Yelena Serova and Samantha Cristoforetti have carried out a series of experiments on the International Space Station on Monday after previous training, Serova wrote in the cosmonauts’ blog ISS Mailbox. 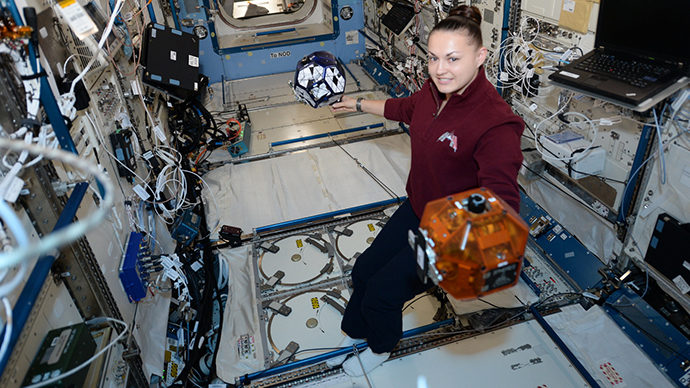 The Spheres are a part of the “SPHERES – Zero Robotics” experiment. They are experimental satellites that can define their position and location and can move according to their programs. The SPHERES program is designed to popularize space exploration among young people. Schoolchildren and students can take part in developing algorithms and in operating the robots from Earth, and even take part in competitions. Teams of students participating in such competitions have to develop software for the SPHERES to accomplish special tasks, for instance, swerving to avoid collision with space garbage or docking with the station. The tasks change every year. The best designs are selected for the competition to operate the SPHERES satellites on board the ISS. The next international competition will start in January. The participants will link up via video conference to control the robots, and the cosmonauts on board the ISS will supervise the event.